A further series of flight trials of Eurofighter Typhoon with the low-collateral, high precision MBDA Brimstone air-to-surface weapon have been successfully completed at BAE Systems’ site in Warton, Lancashire. 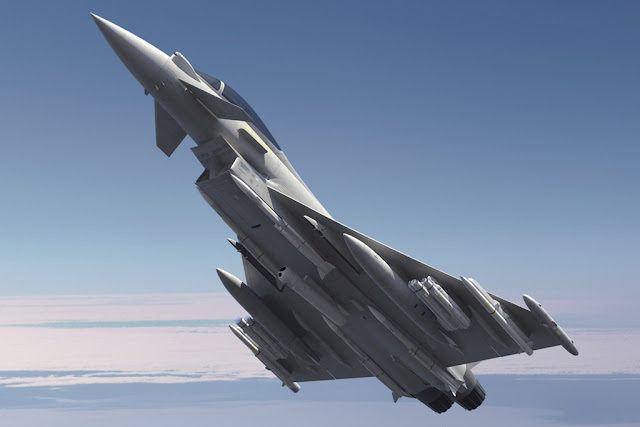 A further series of flight trials of Eurofighter Typhoon with the low-collateral, high precision MBDA Brimstone air-to-surface weapon have been successfully completed at BAE Systems’ site in Warton, Lancashire. The trials are part of ongoing development work on the Phase 3 Enhancement (P3E) package for Typhoon, which will also deliver further sensor and mission system upgrades as part of Project CENTURION – the programme to ensure a smooth transition of Tornado capabilities on to Typhoon for the Royal Air Force by the end of 2018. The trials were conducted using the UK Typhoon Instrumented Production Aircraft (IPA) 6, and formed part of work to gather air data on the weapon and expand the carriage envelope. Firing trials are now scheduled for later this year to test the effectiveness of the weapon in operational scenarios. The flight trials, an important milestone on the integration programme following the completion of ground testing and initial flight trials last year, were partly carried out through a Combined Testing Team (CTT) approach with pilots from the Royal Air Force’s 41(R) Squadron (the RAF’s Test and Evaluation Squadron). In total around 40 trials to integrate Brimstone with Typhoon have seen the aircraft flown with four AMRAAM, two ASRAAM, two Paveway IV laser guided/GPS bombs and two launchers each containing three Brimstone missiles. Eight of the 40 flights have been carried out with 41(R) Squadron. Steve Formoso, Chief Test Pilot for BAE Systems Military Air & Information business, said: "This series of flight trials has included Aero Data Gathering (ADG) flights to test how the addition of the Brimstone weapon and other assets interacts with the aircraft’s flight control system software. The results have been excellent, with pilot maintaining manoeuvrability and experiencing carefree handing whilst carrying a heavy weapons load. The detailed results of these trials will now be analysed and further testing carried out ahead of firing trials. The low-collateral Brimstone will provide the Typhoon pilot with the ability to precisely attack fast-moving targets at range, further enhancing the aircraft’s already potent air-to-surface capabilities". James McLaughlin, BAE Systems’ Contract Delivery Manager for Typhoon Phase 3 Enhancements, added: "This continues to be an incredibly productive time for Typhoon development and the benefits of the Combined Testing Team approach are clearly visible. The dedicated work of our teams has ensured we have been able to conduct a large number of flight trials in a short space of time, involve the Royal Air Force within the process and reach an important milestone on the Brimstone integration programme". The flight trial programme for Brimstone is running alongside ongoing Typhoon development programmes with Meteor and Storm Shadow, which form part of the aircraft’s Phase 2 Enhancement (P2E) package due to be delivered into service in 2018. The CTT approach is designed to allow 41(R) Squadron to get involved in early versions of planned upgrades, providing feedback that can be assessed and directly worked back into the design process, ensuring with an end product which meets Royal Air Force requirements.